Starting today, you can call any phone right from Gmail ,Google has finally rolled our free international voice calls via GMail,it allowing you to make free international telephone calls directly from the Gmail account Web page, users will see a "Call Phone" button at the left of the Gmail inbox. Hitting this button brings up a dial-pad allowing you to initiate a call from your Gmail account to a landline or mobile phone number. The dial-pad also contains your recent call history under a tab above the browsers. 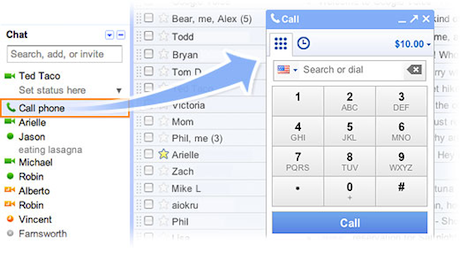 If you have a Google Voice phone number, calls made from Gmail will display this number as the outbound caller ID. And if you decide to, you can receive calls made to this number right inside Gmail. This is really good information for canada and USA users who are interesed for voip international calls. Hey guys, hope u all are gud. I have one great trick to share with you all. I found something on internet while searching for some other tricks for my Android. I found a trick to make International voice call as well as video calls, free of cost. Yeah! FREE but you just need to download skype on your device and after that you not need to pay anything for calls. Its working guys Go for it, It doesn’t take very much time. And now I am going to try the above method. Let’s see the result.